Baby it's warm outside HERE! The sphinx looks carved from snow herself. Hello Merisi, two comments above have already told you my thoughts! See what strong messages your photos send us? I also wanted to mention how much I like the photo of the snowy vineyard. It's a sight I would not have otherwise imagined. Thank you. Beautiful pictures, as always, Merisi. Wish I could send you some of our Mississippi sunshine and spring-like temperatures. That's all I ask for, Merisi...some sun. Another grey day here, but the birds and the garden seem to think that spring is not far away. WHat an inspiring spot to read! I can't help but wonder how one turns the pages of a book whilst wearing mitts. Books can be a great joy to hold in one's hands and become engrossed in. 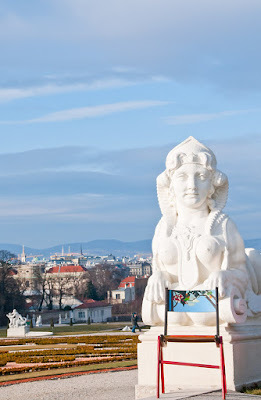 the gardens have been restored to their pristine best recently, the sculpture reflects that. I was already on my drive back to Vienna, when the light suddenly changed and I had to stop by the side of the road to capture this image. thank you! When I close my eyes, I can literally feel spring in your parts of the world. I empathize with you, grey skies ad nauseum here too. I hope spring reaches your shores soon! I invite you to join Maia, who is an artist through and through, for a cup of coffee, get to know her beautiful Colorado home, even travel northeast with her, on her blog ->Une Envie de Sel (she's also celebrating her birthday this weekend!). See some of her work here and here. More links from her blog! 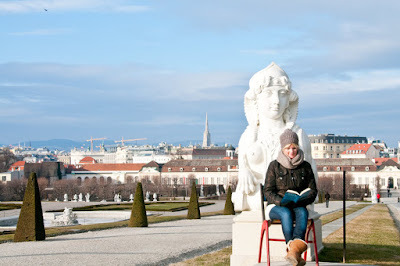 here in Vienna, I often come across readers engrossed in a book. It always warms my heart. And ze COLD has returned to New York with a vengence!